Want to instantly stop a food craving? Gargle with Listerine mouth wash as soon as the craving hits. This tip was inspired by a vistor's comment on a weight loss tip where I suggest brushing your teeth to beat sugar cravings. They pointed out that Listerine is faster and even more potent than toothpaste at stopping the urge to binge eat. I've been testing the Listerine trick for the last several weeks. I don't know whether I've lost any weight because of it, but it really does stop cravings, at least temporarily. To stop a craving, gargle with Listerine. Evenings are the worst time for me. Because I try to control my calories all day long, I often feel the urge to snack at the end of the day and especially at night. Now when a craving hits, I run to the bathroom and gargle half a capful of Listerine. 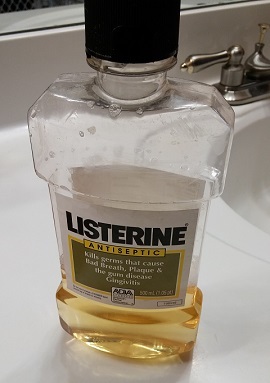 I use Listerine's original gold flavor, which I think everyone would agree tastes horrible. After a mouthful of that stuff, I'm in no mood to eat ice cream, chips, or whatever it was that was tempting me! So, if you're desperate for a way to beat your hunger cravings, try gargling Listerine. And if the original gold flavor is too harsh for you, substitute with one of Listerine's newer flavors like cool blue mint.